This is the third part of a blog series giving a personal take on librarianship, archives, and the powers of words. Start here for the first post in the series. Key 23 is something I only discovered because, working in Auckland for six months, I am using a public library like a regular reader for once – borrowing books simply because they interest or excite me. A lot of the books I’m borrowing are comics – I love the economy of storytelling and really believe, as I was telling the State Library of New South Wales last year, that this medium might hold the future of space, word, and image. Among the comics I’ve been reading is Grant Morrison’s The Invisibles, which chronicles the adventures of a secret society battling extradimensional forces in the run up to the year 2000. In The Invisibles, there’s a drug called Key 23 which makes the user experience whatever they read as real. It’s a lovely conceit, which Morrison also flips by adding the notion of a ‘fiction suit’ which (I may have got this wrong…) allows characters to travel through the world of discourse. However, you still consume Morrison’s work as content on a page, distributed by DC Comics’ mighty media machine. My work with immersive play in libraries aims to create these experiences – a less psychedelic take on Key 23 or the fiction suit – in our everyday lives. 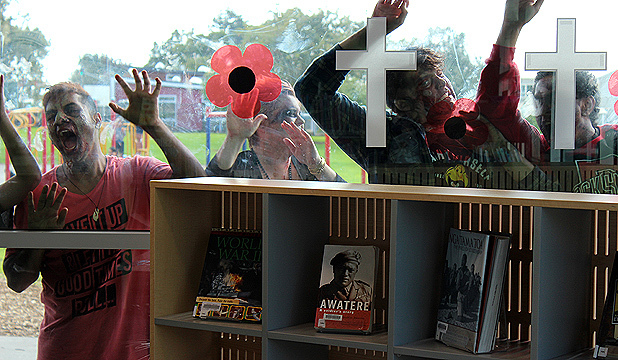 I hope for library users to stand in their civic space and imagine themselves in the world of a zombie siege, or whatever dramatic scenario, and make choices as characters in the story, exploring their decisions and the consequences through play. People get nervous that these kind of activities will all just descend into mayhem among the shelves, but when it’s done right, this immersive play lets you think through your actions and learn in an entirely different way. When our zombie-fighting teens in South Auckland were faced with their friendly community cop, wounded by a zombie bite, they had to decide whether to trust him, sacrifice him to the horde, or restrain him and hope for a cure. It was, frankly, terrifying for me as a facilitator, because I didn’t have that teacherly sense of control – but the experience, the adventure, belonged to the teens – and the freedom to choose was theirs too. (They ended up wrestling the sergeant to the ground and cuffing him when the progress of the zombovirus forced the issue and sent the hapless cop on a cannibal rampage). This freedom to choose your story is, to me, vital. It’s no coincidence that Emmet O’Cuana and I found ourselves talking about existentialist philosophers when we discussed learning-as-play on his podcast The Momus Report. The people who destroyed the culture of interwar Germany – who drove out the exiles and émigrés I studied in PhD days – were the order-followers, the functionaries who obeyed the Nazis without question. My time in the archives, handling the papers of refugees, reading the ink of long gone days, gave me a huge respect for people who rebel against systems, acting as human beings first and job descriptions second. Right now my task is to innovate and encourage new ventures at Australasia’s largest library system. Of course there’s bureaucracy to deal with. Often, even with a simple challenge like kids baking in the library (cooking being one of the most exciting literacy activities, following a recipe and seeing the words in the book come to life in your hands and then your belly! ), people simply report that a faceless ‘”they” said we can’t do it.’ There’s a lot of these mysterious, anonymous authors of guidelines. Sometimes you don’t even get to see the guidelines. My experience in the archives, watching what happened to people at the hands of those who ‘only followed orders’, means I’m usually in favour of finding the actual human with a name and a face who made that judgment call and finding out exactly why they did so. Of course there are allies – fellow travellers who also see that creativity, passion, and personal responsibility are at the heart of what I’m wrestling with at the moment. I don’t mean responsibility in a witch-hunting sense – but rather something like a hero out of Sartre or Camus. Living life through your honestly held choices – even if you’re a council bureaucrat. It’s vital to librarianship, and yet also fraught. On one hand, libraries are all about giving people personal freedom to learn, research, and create – from the UN library mission statement to American librarians’ critique of the Patriot Act. Yet many librarians work for local government, one of humanity’s great generators of bureaucracy and the jobsworth mentality. When librarians forget that their commitment to their vocation precedes the specific terms and conditions of their employment – that their passion should precede their contracts – life is at best a bad episode of Parks and Recreation – and at worst, akin to the world of people who do evil while ‘only following orders’. Right now, at Auckland Libraries, we’re having a robust and profitable internal debate around my Book Domino challenge to the librarians of New Zealand. It was meant as both a flippant challenge and a more serious point about how cheeky and playful libraries should be. Some people involved as book conservators and archivists are concerned that I’m encouraging librarians and the wider public to mistreat books. But they aren’t the ‘bad guys’. As someone whose doctorate was wrought in the archives, I know that marks made on a page are sometimes all we have left as a trace of lives that were lived in this world. I respect the passion of the conservators. They’re not ‘only following orders’ – they’re expressing their whole-hearted devotion to the preservation of print, and respect for books as material objects. I welcome that debate. What scares me are the people who see librarianship – any library role – as just a day job. In fact, it’s a vocation like that of a priest, or lawyer, or author, or teacher. It’s a commitment to living and working in a certain way, that chooses you as much as you choose it. An existential commitment, a commitment to the Nth degree. I worry when I meet library staff who work without passion – who clock in and clock out, and are only following orders. Librarianship and its ancillary roles are about a drive to excellence in the service of your community – now, more than ever, when libraries are under threat from public sector cuts and general ignorance about what librarians do. So – librarians! If you want a safe 9-to-5, you are in the wrong job. Perhaps councils can find room for a few functionaries in the parking team, or administering taxes. Librarianship is a vocation – and right now, one that is under threat, right when the moment is ripe for it to be redefining its future. If you’re ‘only following orders’, librarianship isn’t for you. Great writing and inspiring, thank you, Matt. And I must read The Invisibles!